The Founders Resort View King Suite features one bedroom with a king bed and a full kitchen with an oven, microwave, dishwasher, basic cookware and utensils. 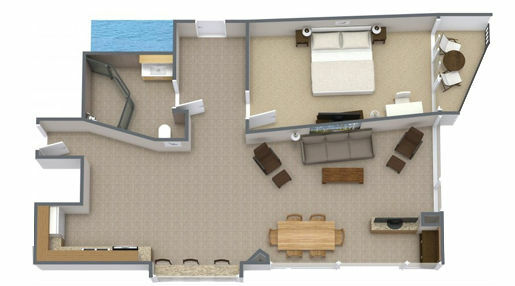 The spacious living room comes with a queen sleeper sofa and a large dining area. The unit also comes with two flat screen HD TVs and a modern bathroom with a glass-enclosed shower.